Teppanyaki Manryu is a restaurant in Gion that let’s you see up close how its chef masterfully prepares food on the teppanyaki grill. The restaurant is quite small, and as its prices are cheap for a teppanyaki place, also very popular. So you should definitely make a reservation before going. One of Manryu’s specialties is their menu. You can find almost anything on their menu, from garlic shrimp to Manryu-style pizza. That’s the beauty of this restaurant – they have something for everyone. They even have some vegetarian menu items! 2,400 may sound a bit dear for 120 grams of steak, but at Manryu it’s not just any steak. They have a limited quantity of three portions a day of wagyu, the kind of melt-in-your-mouth Japanese goodness you often get to eat the best kaiseki places. For 1,600 yen you can order the lean steak option, but if they still have wagyu left that day, I have to recommend you go for the Japanese beef option. One of the best parts of Manryu is that they can accommodate all kinds of people. So for those who don’t eat meat, they also have a green onion okonomiyaki. The okonomiyaki is tasty, and you can have it topped with katsuobushi, or if you don’t want to eat these tuna flakes, you can have it without. In the picture we had it with the tuna flakes. This is Manryu’s take on pizza. It has some salsa sauce between two layers of very thin crust, and then an ample amount of cheese. Looking at it, it really does look like a pizza, and tastes like one too, but with something Japanese in the taste. And it’s of course cooked on the teppanyaki grill! When it comes to teppanyaki, garlic is a given. And what better to have with garlic than shrimp? The garlic shrimp at Manryu go especially well with beer, so remember to order a bottle of Asahi to go with it. 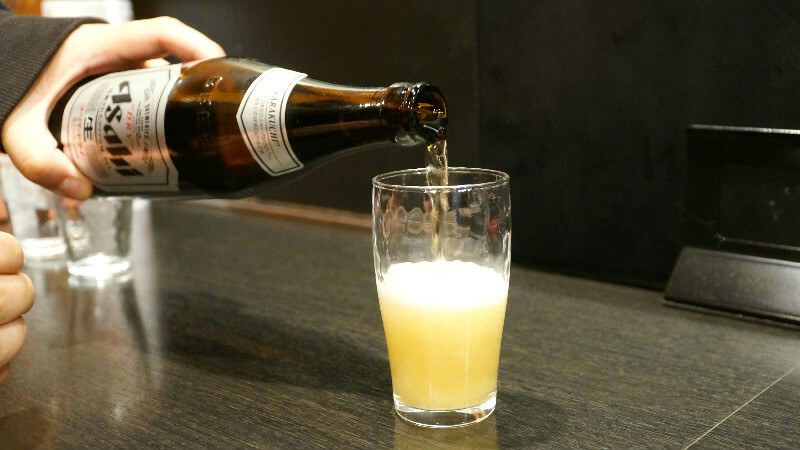 Ordering a bottle of beer is part of the teppanyaki experience. Say “Biiru mou ippon kudasai” for another bottle of beer. Part of the fun of going to a teppanyaki place is the show, and at Manryu it’s very good. You get to see up close how the chef masterfully prepares the dishes, and while it’s fun seeing how they chop up the noodles and the okonomiyaki pancakes, the real star of the evening was the wagyu beef. Expensive, but definitely worth it for the experience, and getting to see the steak being grilled just made the experience that much better. Monday to Saturday: Lunch: 11:30 a.m.-3 p.m. Dinner: 5 p.m.-11 p.m. (Last orders at 10:30 p.m.) On Sundays, they are closed for dinner, but open for lunch from 11:30 a.m. to 3 p.m. The restaurant is very popular so if you don’t have a reservation you may have to wait for an hour or two before you get to eat. VISA, MASTER, JCB / Accepted. They understand some simple English, and they have their menu in English too. Japanese and some simple English.